The personal pace system by Toro means that this self-propelled machine will automatically adjust to your walking speed for your convenience. Making mowing your lawn so much easier. Powered by a reliable Toro TXP 159cc OHV engine with and automatic choke this engine with give you piece of mind and easy to start. The 22" cutting deck with a bar blade means that you can spend more time doing the thing you love and less time mowing your lawn as it will power through your lawn in no time. And the Bag on demand switch allows you to switch from mulching to catcher instantly for convenience and practicality. This mower also comes with Toro's 3-year guaranteed-to-start including a 2 year full coverage warranty! Meaning if anything goes wrong, under normal use and maintenance Toro will fix it for free! The innovation of Toro has seen them design a self propelled mower that adjusts itself to your walking speed according you how hard you push on the handle. 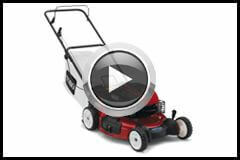 This mower is powered by Toro's premium overhead valve engine which is powerful and efficient. This huge cutting deck ensures that you can get more of your lawn mowed in a shorter amount of time. The recycling mulching system also minces grass clippings into fine pieces and returns them to the soil keeping your grass lush and green. This efficient and effective addition to the mower allows you too switch from mulching to catching in a matter of seconds simply by flicking a switch. The deck washout port is a convenient way to clean the bottom of the deck, maintain if efficient performance levels by allowing the air to circle correctly under the deck. If anything goes wrong, under normal use during the first 2 years Toro will fix it for free!